Boats make their way across the waters of Grand Lake’s Duck Creek during the 2015 Independence Day holiday. GRDA is reminding boaters of the special rules in place for Duck Creek and Woodard Hollow, and also encouraging safe, smart and sober outings on Grand and Hudson lakes and the Illinois River during the upcoming holiday weekend. GRDA Photo by Katie Robbins. Creek is no wake for the vessel at all times regardless of length). • All watercraft longer than 30 feet shall operate at “idle” and avoid producing a wake at all times in Duck Creek. (If the vessel is longer than 30 ft., Duck Creek is no wake for the vessel at all times regardless of width). • All watercraft smaller than both measurements listed above may operate on plane not to exceed 30 mph in Duck Creek from official sunrise to official sunset. 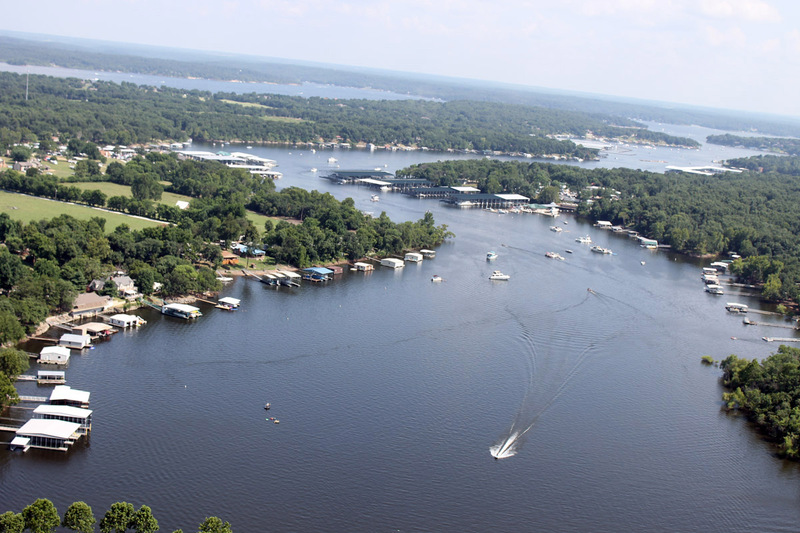 • All watercraft must “idle” and avoid producing a wake from official sunset to official sunrise (night time) in Duck Creek between May 1 and Oct. 1. (No wake in Duck Creek for all vessels at night). • All watercraft must stay to the right of the center lane of buoys and at least 150 feet away from any dock, breakwater, structure or shoreline. • On the actual day of the Duck Creek Fireworks (Sunday, July 3, 2016), all watercraft shall operate at “idle” and avoid producing a wake at all times in Duck Creek (all day, all night). • The area known as “The Turn” (area near Harbor’s View and Ugly John’s) is a no wake zone for all vessels at all times. • Areas north of “The Turn” are No Skiing areas and the vessel size restrictions mentioned above apply to this area as well. • All watercraft wider than 8.5 feet shall operate at “idle” and avoid producing a wake at all times in Woodard Hollow. If the vessel is wider than 8.5 feet, Woodard Hollow is no wake for the vessel at all times regardless of length. • All watercraft longer than 30 feet shall operate at “idle” and avoid producing a wake at all times in Woodard Hollow. If the vessel is longer than 30 feet, Woodard Hollow is a no wake for the vessel at all times regardless of width. • All watercraft smaller than both measurements listed above may operate on plane not to exceed 30 mph in Woodard Hollow from official sunrise to official sunset. • All watercraft must stay at least 150 feet away from any dock, breakwater, structure, or shoreline at any speed above “idle”. While these are special rules for specific areas of Grand Lake, the GRDA Police reminds lake visitors that following lake rules and proper boating practices on all areas of the water is the best way to ensure a safe outing. What follows is a simple guide to some of the frequently asked questions concerning lake rules. • Boats must not operate within 200 feet of any GRDA dam or no closer than 500 feet during generation. • Boats, including personal watercraft (PWCs) must not operate within 50 feet of another vessel when running at speeds over 10 miles per hour (provided this prohibition shall not apply to vessels operating in sanctioned events). • The nighttime speed limit on GRDA lakes is 25 miles per hour. • Wake jumping is prohibited in any cove, creek or hollow. • Water skiing, jet skiing and similar activities are permitted only during daylight hours and are prohibited upstream from above Twin Bridges, in Elm Creek, east of Grove. A boat towing a skier must have a person (at least 8 years old) in position to observe that skier, unless a rear view mirror has been installed for boat operator observation of skier. Finally, GRDA Police continues to stress the dangers of drinking and boating. According to the United States Coast Guard’s most recent statistics on recreational boating (2015), alcohol use remains the leading contributing factor in boating accidents. Nationwide in 2015, there were 260 accidents, 228 injuries and 91 deaths as a result of drinking and boating. GRDA officers will be continuing the “I Got Caught” life jacket campaign during the July 4 holiday, on GRDA lakes and the Illinois River. As part of the program, free t-shirts are given to those boaters who are “caught” wearing their life jackets on GRDA waters. Finally, if you are on the water and need immediate assistance, the GRDA Police recommends you call 911. However, if you are on the boat with no cell phone access, you can use Marine Band 16 to radio for help. For more information on the department and lake safety, or for information on how an officer can assist you, contact the department at (918) 256 0911 or visit us online at grda.com. For more information on the lakes area, water safety or GRDA’s lake-related permits, you can also stop by the GRDA Ecosystems and Education Center in Langley.